Hmm…this does not bode well. First of all, to answer a couple of comments on the last post: Thank you! The back actually isn’t as complicated as it looks, aside from the strap assembly–it’s basically a lot of gathering. And yes, Gail, I was already planning on doing a hand-picked zipper. (Both the pattern and the class specifically call for it.) But thank you for the suggestion regardless! I spent the afternoon and evening with my best friend, who happens to be an avid crocheter and is completely thrilled that I’m attempting a yarn craft. So, of course, I worked on knitting while she crocheted and we chatted and watched a few episodes of Doctor Who and such. Which led me to this…. It took me several failed attempts, a demonstration from my mom, and several more failed attempts to get this started. The good news is, once I got a few rows into the ribbing, the double-pointed needle thing got a LOT easier, and I was actually able to make some decent progress tonight. I’m thinking that my best bet would be to try decreasing the amount of stitches some after the ribbing–these are meant to be long fingerless gloves, and the ribbing is a pretty good circumference for my forearm (despite the fact that I also realized I was supposed to do the ribbing one needle size down. Oops.) So I don’t want to decrease the overall number of stitches right from the beginning. Any thoughts from the knitters who might be reading this? I now know how to actually get the double-pointed needles to work. At least, once it’s started. 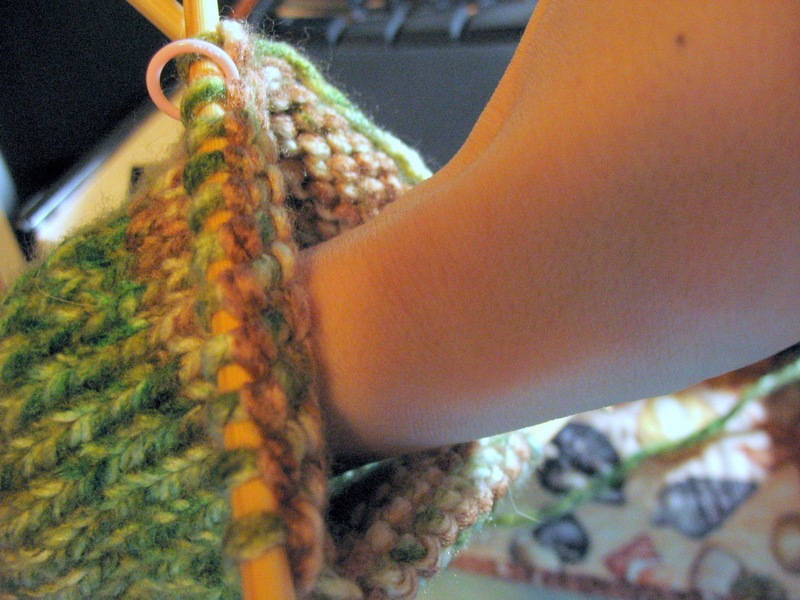 I also know I can make ribbing without too many headaches. I think I’ve figured that I like working with bamboo needles a lot more than I like aluminum ones. I tried both this afternoon, and the stitches just slide off of the metal far too easily, which meant I kept dropping lots of stitches. I was having the same problem with the single-pointed needles, and ended up using the bamboo for almost the entire scarf and the entire dishcloth. So that’s good to know, right? And I know I like the way this yarn looks knitted up! 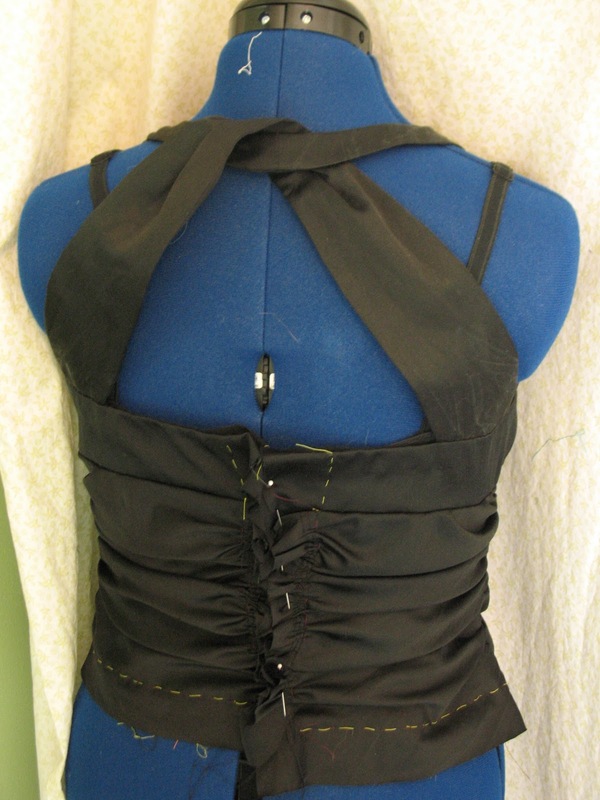 As of yesterday, I think I have the bodice done, other than installing the zipper. I’m not entirely certain…I’m having a bit of paranoia that with all of the layering from the 2 layers of outer fabric, the underlining and the lining, it’s not going to fit once I put the zipper in. 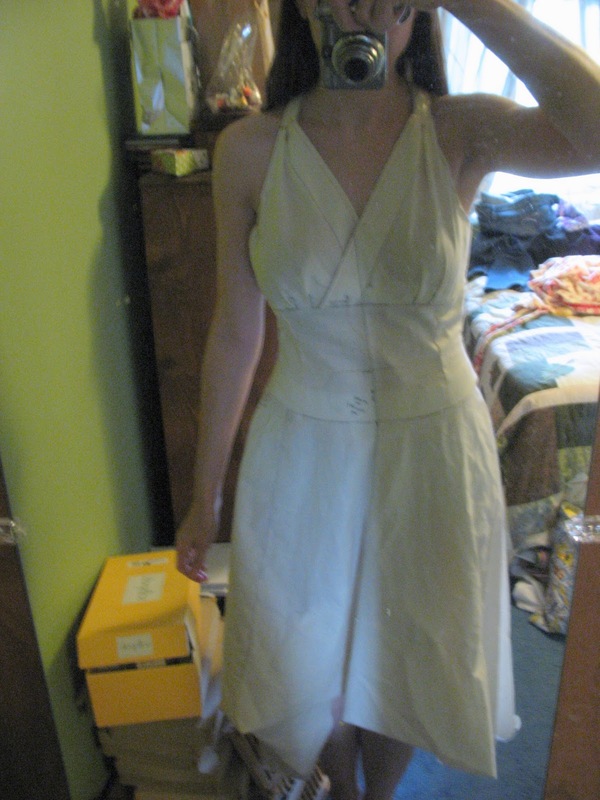 So I think my next step is going to be to baste that in before I sew the skirt on, just to double-check the fit. Hopefully it’ll be fine, but I’d rather know if I have to let it out now while it’s relatively easier to fix. ….and the back. The straps connecting the back to the halter lay better on me than the dummy. This is just pinned closed for now, obviously. But at least now I have some visible progress! 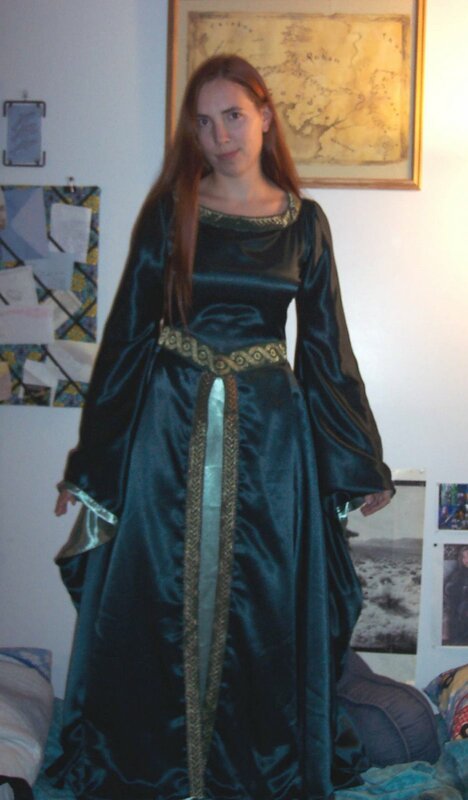 And I suspect that adding the skirt will go fairly quickly, although I may need to work on the lining a bit. Since I ended up having to use some of that to underline the skirt as well, the lining is probably going to be several inches shorter than the actual skirt, and so I think I’m going to have to find a creative way to extend that. I’ll probably be going to Joann’s tomorrow to see if they have some kind of wide trim I can use. 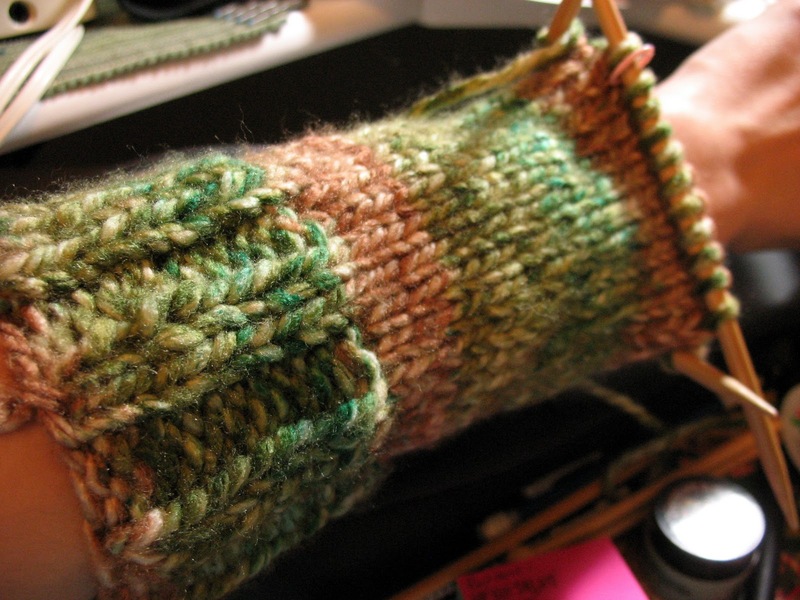 I’m playing around with learning how to do a basic increase now, because the next thing I want to tackle is these handwarmers. But not with their yarn, because, you know, wool and I don’t get along. So I’m going to be using this Serenity Chunky Weight yarn in Forest. Hopefully it’ll turn out ok– I actually have to figure out gauge for this one. 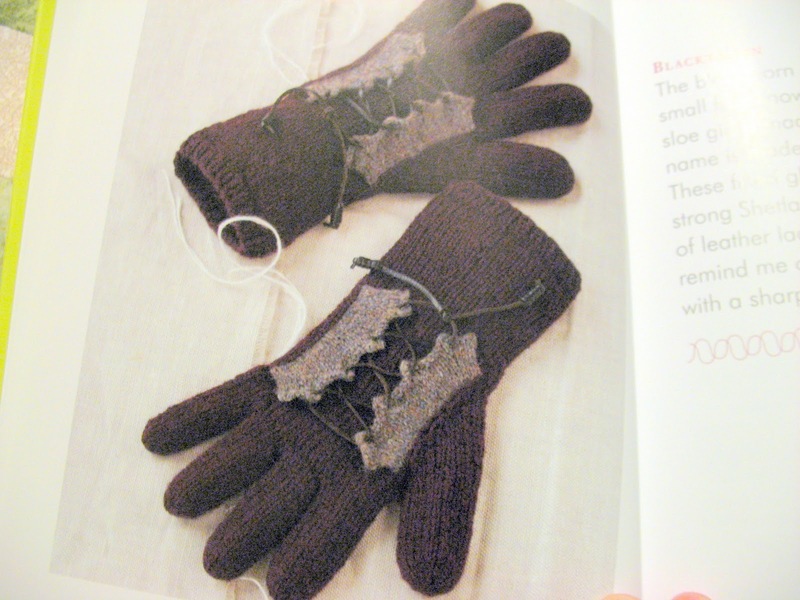 And how to knit in the round on double-pointed needles. Oh yeah, this will be interesting. Every snow cloud has a silver lining. And mine was that the school I teach band at got dismissed before I had to leave my house, leaving me time to sew that I would not have had otherwise! I took a break from the LBD today. I needed one…I’m getting frustrated with the slooooooooow progress. It actually feels like I’m making more visible progress on my current knitting project, and that’s just sad. So I decided to deal with a UFO that was sitting on the table so I can rethread the serger for the Pendrell Blouse, now that the sewalong is actually at the point of sewing. Remember this Anthropologie shirt I liked? Well, here’s my version…. There’s definitely things that could have gone better with it. The main thing was that I didn’t get a whole lot of gathering in the lower section, because I just didn’t have enough fabric to pull it off. 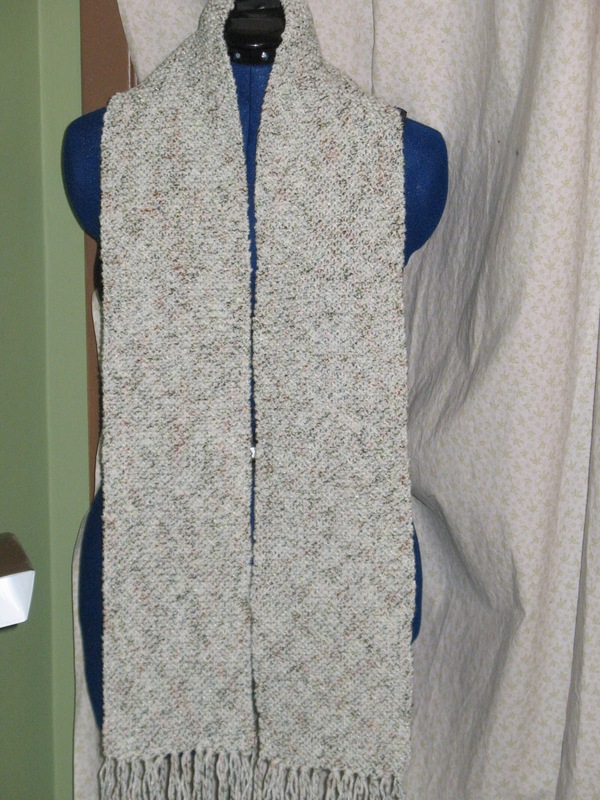 And it probably would have been better with a somewhat lighterweight, drapier knit. I chose to go with this one for the warmth factor, though, because thin knits in winter means I’d never, ever be able to actually wear it. So I angled the lower portion more to compensate. I think this one looks more flattering on me than Donna, actually. (Good thing!) Though I still may end up taking it in a bit on the sides, because I feel like it looks kind of big on me. The other thing was that I decided to take the easy way out and just finished all of the edges with the rolled hem on my serger. 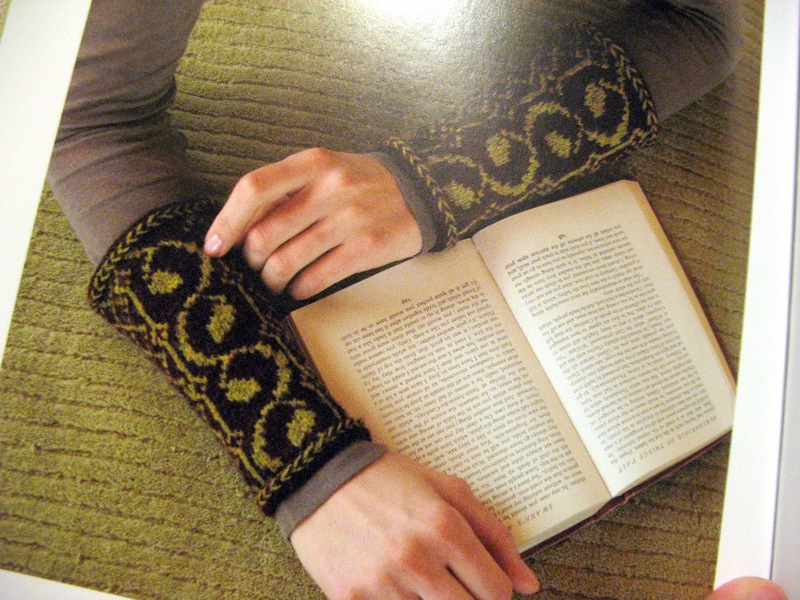 Honestly, the sleeves would not have been long enough to finish them any other way, which I’ll have to remember the next time I try to use the Lydia pattern (which is what this one is based on.) I should have known they wouldn’t be…. So, there. I am feeling better about my sewing again, now that I know I can say that at least I finished one project in the course of this entire month. Especially since it’s looking like I may have to rip out all of the handwork I did on the dress yesterday and change some things. Sigh. So I only had time to stitch in one of those lining pieces, in the end. But it looks really nice going right up to the edge like that, doesn’t it? Also, thanks for all the encouragement on my last post! 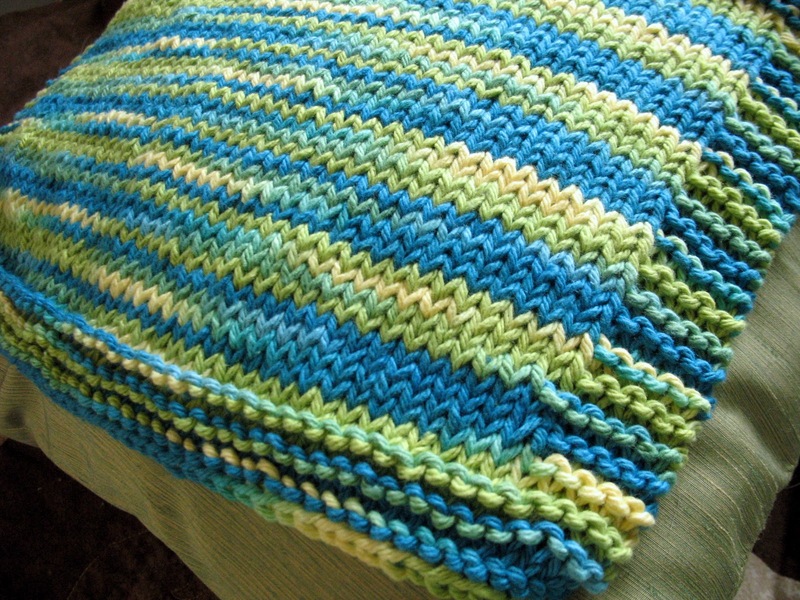 I have plans to start on a new project to work on my purling skills–nothing major, just a dishcloth. But as requested, I will continue to show my progress in learning this new skill. I finished my scarf today! Not my first one, since I had a disaster attempt back in college. There’s really nothing very exciting about this scarf, since it’s entirely knit stitch and made out of some worsted-weight acrylic yarn that could probably be found at any craft store. Except that it’s the first scarf I ever made that actually worked. It has the same amount of stitches at the beginning that it does at the end, it didn’t get wider or narrower, and I only had to rip stuff out once. A closer-up view of the yarn-this is probably closer to the actual color. 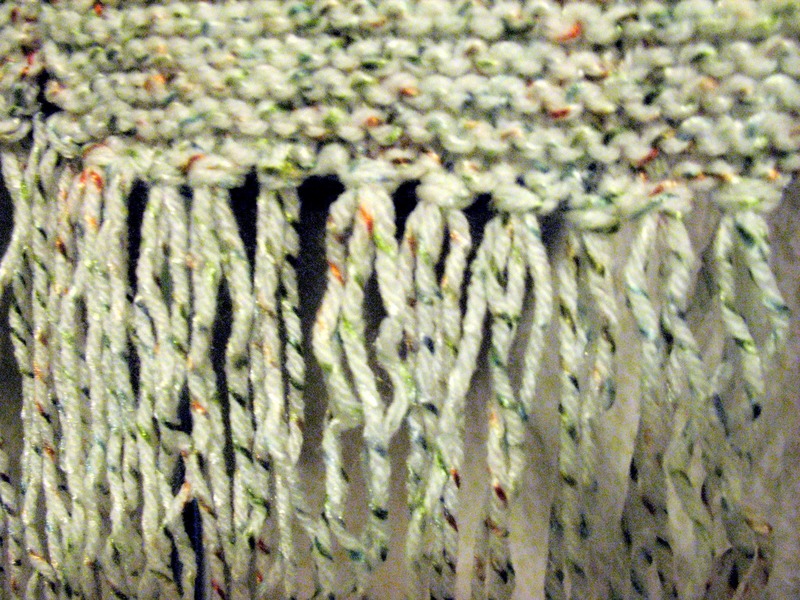 It has this one strand of variegated shinier fiber, which I like. Since I like to name my projects, I’m going to call it my “Winter Winds” scarf, after this song, because the album it came off of ended up being my favorite musical find of last year. And the title is highly appropriate, since this is meant to keep those out. And they just look like they’re having a lot of fun in the video. Next step: learn how to purl. And maybe put the stitches on the needle myself this time. Though I think I’ll try it on something smaller. Like a dishcloth. But not yet. Since it’s supposed to be insanely cold tomorrow and I have no plans to go outside of the house, tomorrow is going to be a massive sewing day on the black dress! …I do have some things to tell. #3 I didn’t bother taking pictures since I already showed something nearly identical, but I did make a second pair of those boot stuffer things this evening. 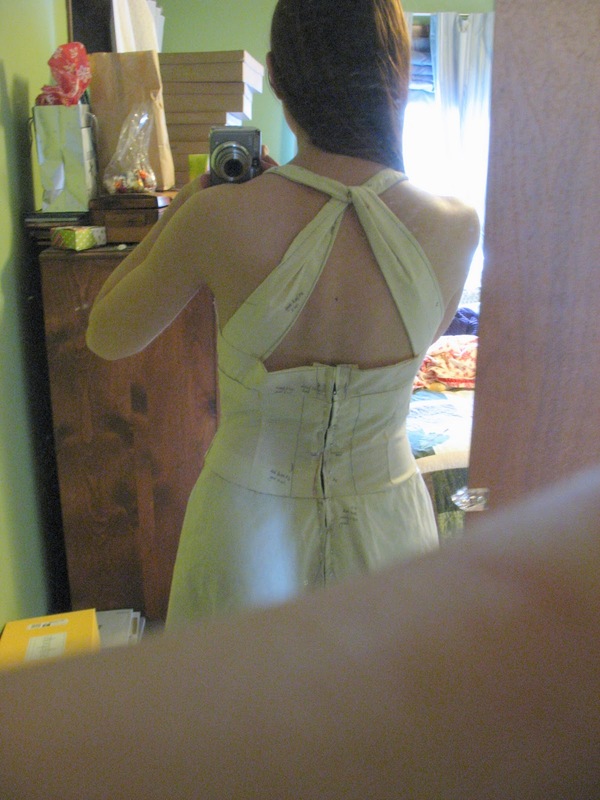 #4: I’ve also done my first full-bust adjustment! 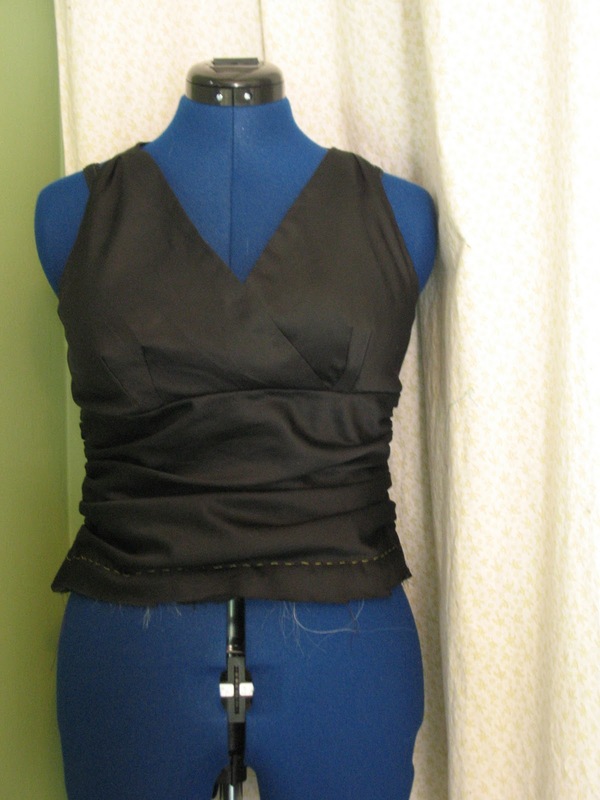 I’m doing the Pendrell Blouse Sew-along, which thankfully is moving along slowly enough that I’ve been able to work on that and the LBD at the same time. (In fact, other than double-checking my measurements, I really didn’t have to do a thing until post #6!) I also have that cut out as of last night, so I may have something to actually show before too long. 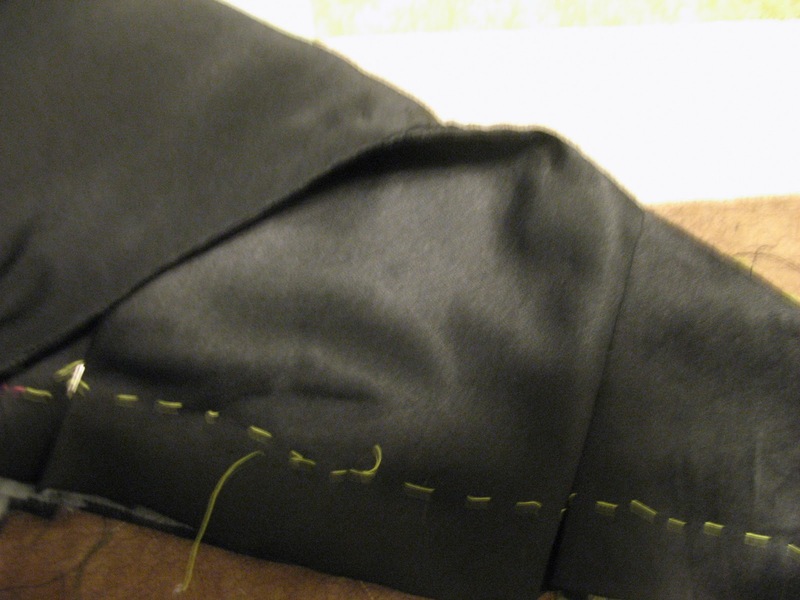 Regarding that fitting issue–with a little help from Donna, this is what those pleats are doing. Ugh. Not a flattering side view at all. 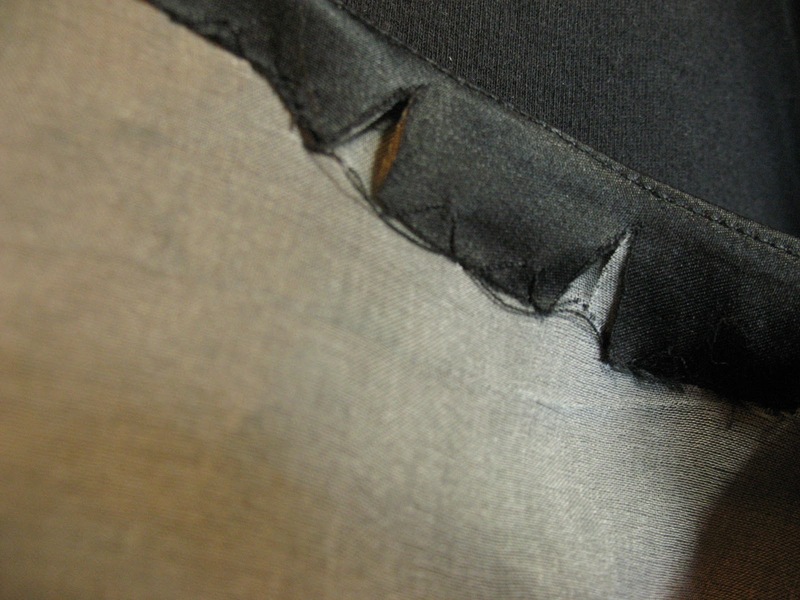 So I’m trying to figure out if I’d be better off doing stitched down pleats, or darts, or other more complicated tweaks. Hopefully Susan (the class instructor) will have an answer for me on that soon. In other news, the scarf is coming along. Somewhat. I ended up having to rip about an inch and a half out yesterday because I discovered that somehow, I knitted a hole into it. I’m not really sure how. It is gone now, but I haven’t recovered all the ground I’d previously made last night. Maybe I’ll catch up a bit tonight–I’m somewhat under the weather so I’m skipping rock climbing. 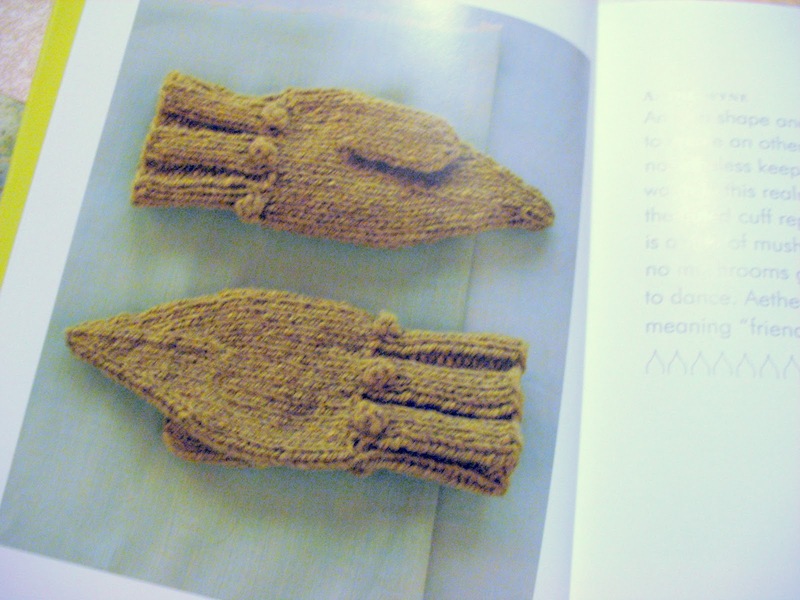 Also, my mother is a bad influence, because she’s the one who pointed out what ended up being my first knitting book purchase when the two of us were out at Joann’s yesterday. (I did not buy fabric. Just $.99 patterns. Because I need to use up that ginormous stash somehow!) Obviously, I can’t make anything in this book any time soon, but this will serve as good motivation for me to actually keep working at it, because I really love several of the patterns! I’ve spent hours and hours over the last 3 days basting all of my underlining to the outer fabric of the dress. And a big chunk of today getting the bodice all basted together. I have to admit, the underlining process has been rather a pain. I guess I didn’t really know how to handle silk organza, because it kept shifting around on me, and half of the time, the marks had disappeared before I actually got to the basting. (For the record, this was using tracing wheels and chalky pencils and that sort of thing, not disappearing markers.) 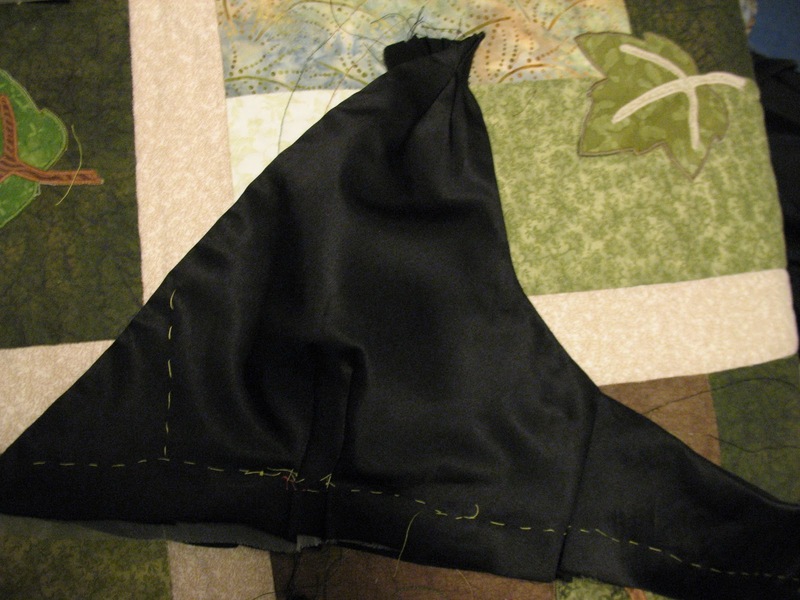 If it hadn’t been for that, I think it would have been ok–the crepe de chine on the skirt went much more smoothly. 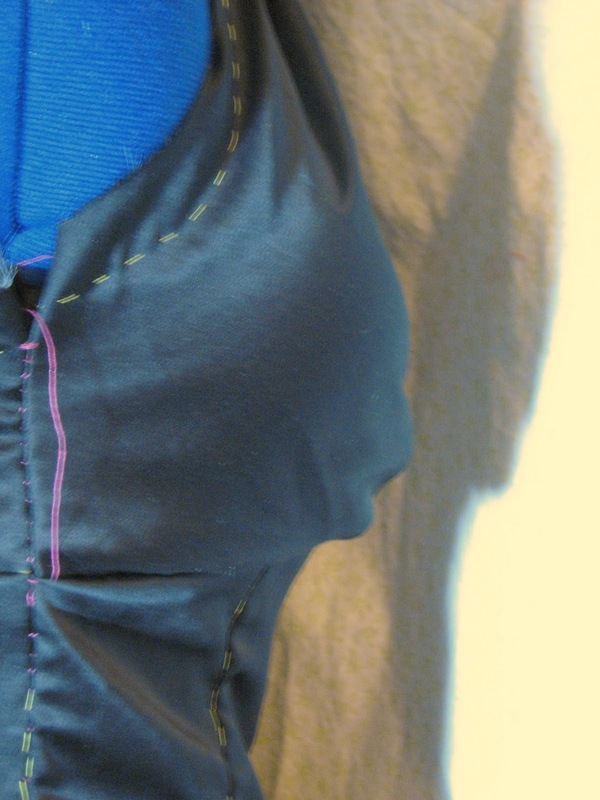 Unfortunately, I can’t show any pictures right now, because I basted in the zipper (into the wrong seam, because I guess it’s just that kind of day), and the bodice is HUGE on me. I’m going to have to take it in all over, I think. And then re-mark all of the seams. But I guess it’s better to know now, while it’s only hand-basting and easier to fix, right? Anywhoo…still no word from the instructor about that muslin, so I went ahead and did a quickie project. I really do like my big tall boots. I started wearing them somewhere in the vicinity of the end of high school/beginning of college, and they’ve been my go-to winter shoe ever since. And I have to buy some pretty pricey ones in order to fit my oddly-sized feet (note to shoe manufacturers: extra-wide feet does not automatically equal extra-wide calves), so I pretty much literally wear them until they fall apart. 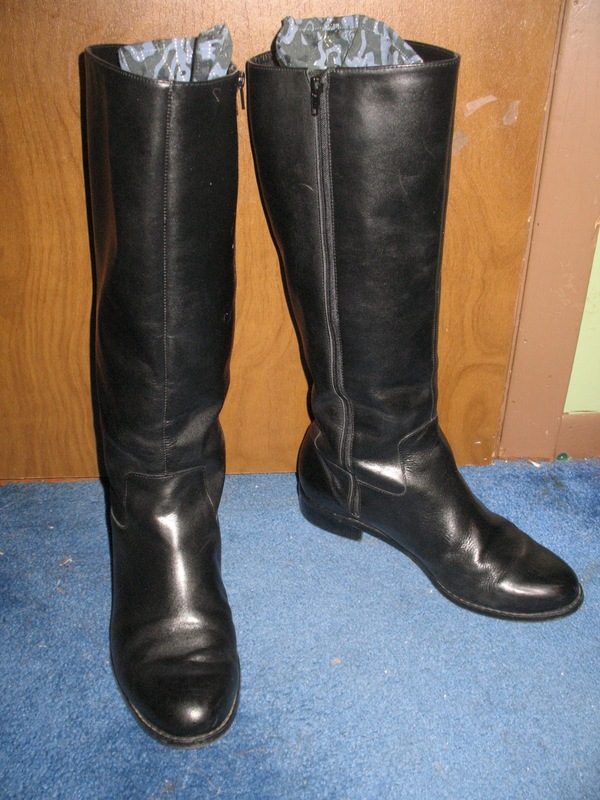 (Actually, the first pair I got, I still have even though there’s holes in the sole of the heel– I’ve used them as my pirate costume boots with a little help from some self-stitched gaiters, and also as riding boots one summer that I took lessons, between my two years of grad school.) So this is to help them last a little longer, because they flop over at the ankles when I put them back in the closet after a day. I got the idea from a recent post at Craft Apple, and it was really simple to sew–basically just an open-ended tube that’s stuffed and tied. And everything was stuff I had on hand: the fabric was from my scrap bin that I put together in last week’s organization binge, the cording was left over from lacing up the back of one of my Lord of the Rings-inspired costumes, and the stuffing actually busted an entire piece from my stash! I had almost a yard of this canary-colored fleece that I think was given to me for free, because I can’t think of any reason I would have bought it. And I had absolutely no idea what to do with it. So I chopped the entire piece into smaller bits and used that to stuff these. It might sound kind of wasteful, but in a way it was actually pretty practical–if I ever need to clean these since they’re inside my shoes, I can just untie the bags, dump all the stuffing into a mesh laundry bag and it’s completely machine-washable. And like I said, I couldn’t think of anything I’d actually sew out of it anyway. So there.One yard down, a thousand to go. Or something like that. So here’s the muslin for my little black dress now. 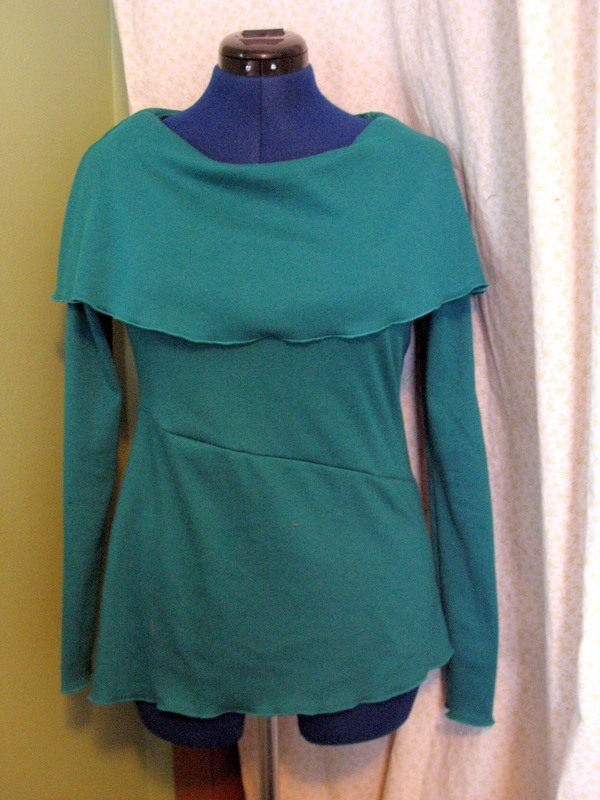 Not entirely what it’s going to look like, since the armhole curves aren’t quite tucking in with the ginormous seam allowances, and the midriff part is going to have a gathered piece over top of it. 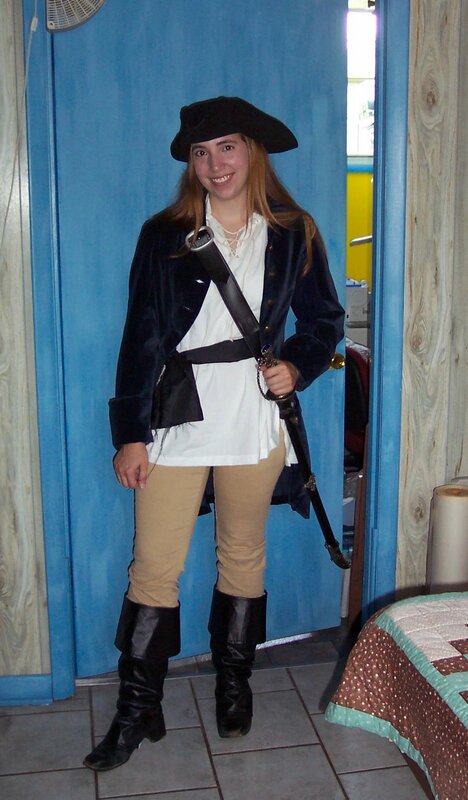 Plus the skirt was only pinned up roughly when I took the pics. (I stuck it on Donna and marked it/chopped it to a more reasonable length afterward.) But I think the fit is pretty good now! 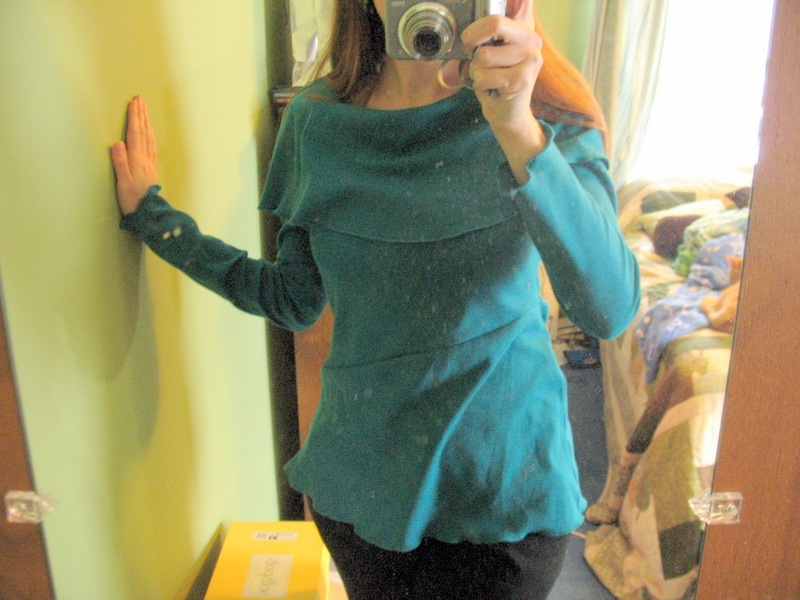 I’m amazed that I had to do so little to the bodice, actually–had to do a bit of tweaking where it hit the midriff to get it to stop gapping, but I was pleasantly surprised to find that the neckline was pretty much perfect as it was. I thought for sure I’d have to raise it, but as long as it’s not gapping, it’s good. So that’s where things stand on my dress now– I’m waiting to get the go-ahead from the class instructor before I move on to phase 2, which is going to be making this muslin into a pattern/marking everything on the underlining/ basting all of that to the actual fabric. As soon as I figure out which side of the fabric I actually want to use–there’s a matte side and a more shiny side to it. 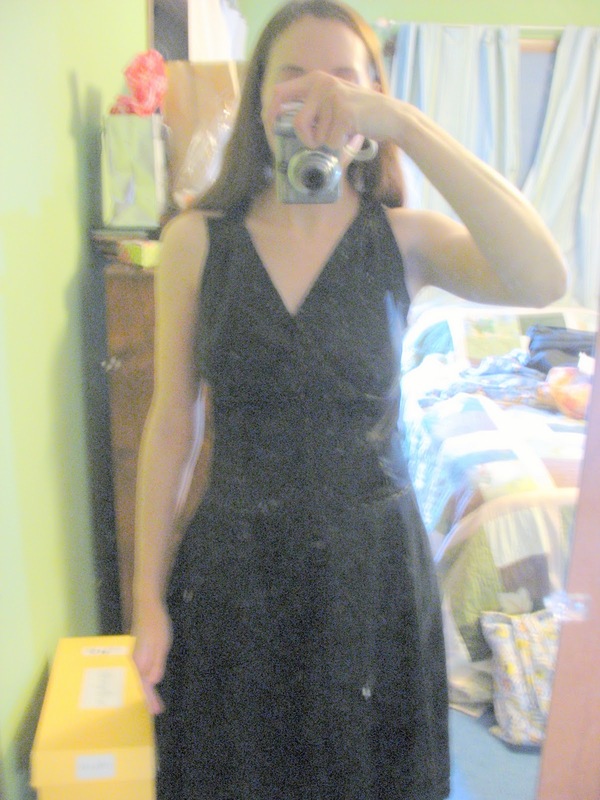 (I’d take pictures, but you know, black fabric never shows up right.) I’m actually thinking the matte side just so I can more easily make it work with the dress it up/dress it down thing, but I do love shiny things… And I also need to figure out just what, exactly, I’m going to underline the skirt with. I’m not sure it will have the right drape if I use the silk organza, but I’m also not sure I have enough of the silk crepe de chine that I got for the lining to use that. The cotton/silk blend washed up wonderfully–it’s SO soft to the touch! I think I’m going to end up with some leftovers from it, because even though when I laid out the pattern on the muslin to estimate the yardage, and didn’t attach the lower piece of the long skirt, I didn’t realize that the skirt was going to be quite so long as is. So I ended up chopping at least 8 or 9 inches off of the muslin! I’m hoping that maybe I have enough left over to make myself some kind of sleeveless blouse from the rest, because I suspect it would be wonderful to wear in the summer! I just may have to do some kind of quickie project this afternoon, though, because I have some time to sew and I don’t want to waste it on waiting!